Jessica is a native New Yorker who enjoys helping others reach their fitness goals. Working as a health care provider for 10 years, she has witnessed how an unhealthy lifestyle can harm people physically and emotionally. That is why she decided to make personal training her full time job. Now, she can use her knowledge of fitness and experience as an athlete to be a resource for others. Aside from personal training, she practices the martial art of Brazilian jiu-jitsu, a grappling sport that involves using techniques to dominate your opponent. She is currently a blue belt, and has competed and continues to train for competition every day. 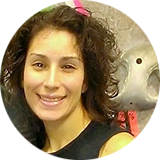 NASM, TRX, Registered Cardiovascular Invasive Specialties and is Currently Pursuing PES Certification. While she can cater to any group, she specializes in personal training, with a focus on Strength/circuit training for athletes. What are some things that are important to you and your lifestyle? Personal health and exercise are important components of a quality life. Nutritional knowledge and proper exercise go beyond vanity to improve one’s quality of life and prevent certain illnesses from developing. As a Registered Cardiovascular Invasive Specialist, I cared for patients with heart disease and other comorbidities. Of the patients I saw, only a small percentage developed these conditions through genetics. For most patients, poor nutrition, lack of exercise, and sedentary lifestyle caused their heart disease and associated risk factors. Perseverance and determination are two traits that have always attracted me. I believe they are the keys to happiness and success. Life has its ups and downs, and pushing forward, even when you feel like you’re not progressing, is what helps you grow and become the best version of yourself. On my free time, I enjoy trying new workout programs to challenge my fitness. I also enjoy discussing films, good books, and laughing with my friends and family. I would want to be remembered as someone who always gave a 100%. Even when I haven’t been a natural at something, I’ve given my best and always continued to work hard, push forward, and maintain focus. As Eleanor Roosevelt once said, “What is to give light must endure the burning.” The burning. That’s what it’s really all about. Resilient might be the word which best describes me – as a person and as an athlete. While I’ve had a lot of success in my career and my practice of jiu-jitsu, I’ve also gone through times of frustration. Success is great, but these tough times are what truly test my dedication to the things I love. I know that having the ability to bounce back and learn from adversity is the key to my long-term success.